"Who is Darkman?" appeared in comics and billboards all over the place. I was incredibly excited to find out who and what Darkman was back then. Since I grew up in the same town as Sam Raimi, I had one of those nearly meaningless connections to the director, and was a default fan of his work. Opening night, I found out that Darkman is a goofy skin scientist that boo hoos his way around town, not spending much time in the dark. Yes, the name "Darkman" was probably supposed to be some metaphor for the dark aspects of his life that he has devolved into. But since the plot hinges so much on the fact that sunlight would undo his brilliant skin invention, you would think he might be better served running around in the.... you guessed it: dark. If Darkman has incredible strength from the surgical procedure that eliminates his pain, why aren't there other patients running around with the same condition? There could be a whole sqaud of Darkmen. If this same procedure eliminates his pain, why is he always yelling in pain whenever he fights the bad guys? If his lab was destroyed by the bad guys (which probably cost a buttload in grant money), how was he able to quickly build a new (and better) lab in the abandoned bungalow? How come Darkman can make these skin masks that are exact replicas of the bad guys, and also manage to alter Darkman's height, stature, mannerisms, and voice? That is some invention. Why the hell does he keep running around in the daytime when his skin thing dissolves after 100 minutes of exposure to the sun? The dude could have a whole new existance (and look like Liam Neeson for hours on end) if only he DID IT IN THE DARK. Darkman has other unanswered questions, but if we could get to the bottom of these first few, we'd be on our way to a much better movie. 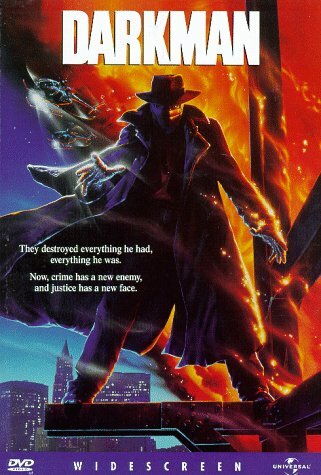 I know that Darkman is supposed to be a comic book-styled movie, but that doesn't excuse holes in the plot. I may have been spoiled by the works of Alan Grant and Frank Miller, but I feel that comic-styled writing is still supposed to be good, and not an excuse for stupid plot devices.